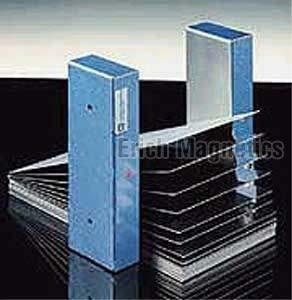 We manufacture, export and supply excellent quality and efficient Magnetic Sheet Floaters. These are faster and much safer alternative for handling stacks of sheet stock. Our Erich Permanent Magnetic Sheet Floaters provide a constant, powerful magnetic force that automatically fans sheets apart without causing any risk of electrical hazards. The machine operators and robotic arms can safely remove one sheet at a time, thus eliminating the chance of jamming or damaging the machinery. Our Magnetic Sheet Floaters consist of a stainless steel casing with an anisotropic magnet system installed inside. The casing and the magnets are held in position with a steel back plate. Each unit can be mounted on the workplace or can be free standing. Choosing the right floater depends on the various factors such as thickness of the sheet, dimensions of the sheet, height of the pile, surface quality of the sheet, sheet conditions, etc. The floater must be higher than the pile of sheets in order to achieve the correct separation. These floaters are available in various sizes and magnetic strength. We also design and manufacture as per customer’s specific requirement.